This story has been updated. Find the latest version here. Four survivors of Tuesday's Taquan Air floatplane crash near Ketchikan were flown to Seattle for additional care, the Associated Press reported. All 11 people on board the plane — the pilot and 10 passengers — were initially brought to the hospital in Ketchikan after being rescued Tuesday. Mischa Chernick, communications manager for PeaceHealth Ketchikan Medical Center, told AP that six people were evaluated and released. One was admitted to the hospital in fair condition. Alaska State Troopers identified the pilot as 72-year-old Mike Hudgins of Ketchikan. Troopers said he reported the crash. 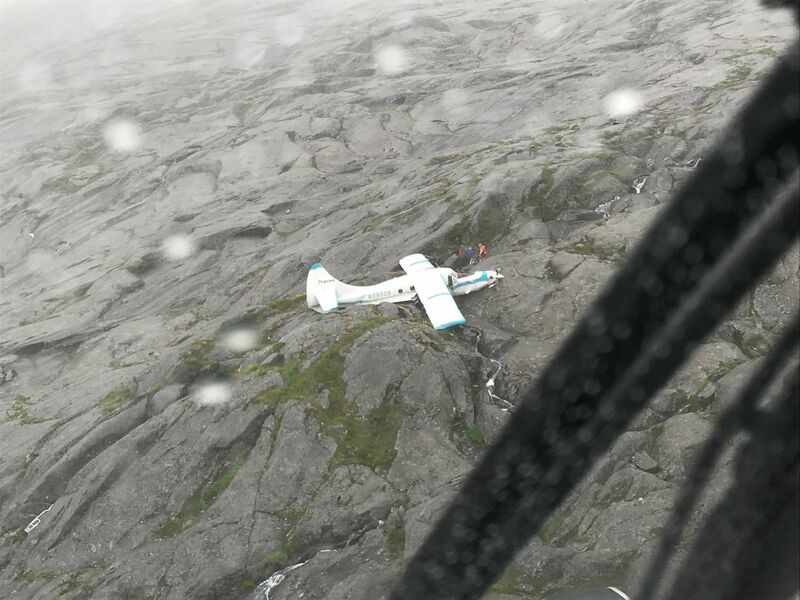 A Taquan Air floatplane carrying a pilot and 10 passengers crashed Tuesday morning on a mountain near Ketchikan but everyone aboard survived. The pilot picked up 10 passengers at Steamboat Bay Fishing Club on Tuesday morning, a representative of the lodge on Noyes Island said. The plane crashed into the side of Mount Jumbo on Prince of Wales Island around 9 a.m. The area is nearly 40 miles southwest of Ketchikan. The pilot reported the crash — and the remarkable information that everyone aboard the float-equipped de Havilland Otter had survived. All of the 11 people aboard suffered minor injuries but were otherwise in good condition, according to the U.S. Coast Guard. Everyone was stable. But then, as authorities and family members waited for specifics, poor weather conditions and rough mountain terrain made for a challenging rescue. With the crash site hidden in the clouds, U.S. Coast Guard crews in two Jayhawk helicopters struggled to find the downed Otter even with its emergency locator beaming a distress signal. Crews battled visibility of about a quarter-mile, according to Petty Officer Charly Hengen. Rescuers got to the plane just after noon Tuesday, more than three hours after the crash. By 1:15 p.m., one of the Jayhawks had hoisted all 11 people off the mountain and down to a staging area established by Temsco Helicopters Inc., Hengen said. From there, Temsco flew the plane's occupants over to Ketchikan. "Every ambulance in town" came to the Temsco pad to pick up patients, said Chris John, commander of the Ketchikan Volunteer Rescue Squad. Everyone but the pilot rode in an ambulance to the hospital, John said. The trip was just precautionary for a few of them. Taquan Air of Ketchikan operated the aircraft. The pilot had not been identified as of Tuesday evening. Taquan suspended all scheduled flights Tuesday and is "cooperating fully" with the National Transportation Safety Board, Federal Aviation Administration and other authorities "to examine every aspect of this event," the company said in a statement emailed Tuesday afternoon by Thompson & Co. PR firm. "It is imperative we understand the factors surrounding this incident to help prevent similar ones," the statement said. Taquan also thanked the dozens of people who participated in the rescue, including NTSB, FAA, Alaska State Troopers, Temsco, the Coast Guard, the rescue squad and "the entire Ketchikan community." The Otter is the same type of aircraft as a Promech flightseeing tour that crashed in Misty Fjords National Monument in 2015, killing all nine people aboard. Taquan bought out Promech's Alaska operations in 2016. Weather at the time of the crash was approximately 2-mile visibility, 3 miles of ceiling, broken clouds at 1,200 feet, overcast at 1,700 feet and 58 degrees, according to the Coast Guard. Drained but happy rescuers breathed a sigh of relief by afternoon. "This is good. It's a good outcome. It's encouraging," said John, the rescue squad commander. "It's just so scary when you hear about a plane full like that. We all feel really, really good it came out so well."